[Thomas Clauser] had his basement flood last year when a hurricane swept over New England. The problem with flooding or leaking water is that chances are you won’t notice until it’s too late. He decided to protect against this in the future by building his own leaking water detector. It’s a simple device that sits on the floor of his basement and triggers an audio alarm if water begins to cover the floor. He used an old smoke detector for the build; a nice choice since it’s loud, and designed for long-term battery operation. It also has a button for testing if the detector is working. [Thomas] removed the PCB from the smoke detector case and soldered wires onto the test button contacts. He cut a sponge to squeeze it inside of a PVC pipe connector housing. That sits against the floor, with the wires for the test button contacts placed through the sponge. If water is soaked up by the sponge it completes the circuit and triggers the alarm. A few other design features really make this a nice setup. He notched out the bottom of the PVC connector so that water can flow freely, and added a switch to one of the probe wires lets him kill the alarm when inspecting the damage. I had a commercial one and I stopped using it. I want one that sends a signal to my computer which then emails me, plays a sound, etc. The last time I got flooded, I heard the noise when I got home after I unlocked the door. Then I slogged through the water, picked it up and disconnected the batt. If I had been home, it would’ve worked well. But I’d been at work for 8 hours. Anyone have one that can signal 1-wire wire or something else on a linux box? You might want to take a look at the low-end wireless home alarms. I have one that can monitor up to four remote sensors for doors, motion and water. I’m going to connect the four LED outputs from the monitor to a Linux board that’s on my LAN, and from there, email to my phone. This is the kind of thing that needs to be mass produced. Ingenious! models from $10 and up. They are all over the place. I bought 3 of them for $6.00 each and they came with $4.0 of CR123 batteries. The commercial versions will go decades without battery drain, they only use the battery when the probes get wet conducting electricity that powers up the alarm. The advantage of this kind, is it will tell you when the battery is getting low, and alarms can be found for as little as $5 new, and we are supposed to replace our other ones every 5 years or so anyway. I love this idea, although it could be even better if he used a carbon monoxide detector. Double detection, double protection! Very awesome! I always worry about this issue with our basement. I keep meaning to purchase some I see on Amazon but hell I might just go ahead and make one. Since pure water isn’t conductive, you’re reliant on dissolved salts and contaminants to provide it. Testing it with tap water won’t necessarily tell you that it’ll work with water from another source, such as rain. If I were making one of these, I’d consider dissolving a lot of salt in some tap water, saturating the sponge with it, then letting it dry. That way when the sponge saturates from flooding, you can count on salt being there to provide the ions to close the circuit. Just a thought. Very clever idea to use a smoke detector. Good job. I would second this suggestion! Very nice, did the same thing, except i just ran long wires from the “test button” so i could still mount the detector on the basement ceiling and then have the detector on the floor near the drain that sometimes backs up. My probe is less refined too. it used a bit of an old tv remote, wired to different pads on the naked keypad circuit board. and then taped to the floor. Basement watchdog has an identical product for 10 bucks. But it lacks the sponge, which I can see as quite useful. The commercial ones I have run the leads up and out of the housing then around the bottom, so the whole thing floats and will continue to yelp when it’s in feet of water. ‘course, when the basement flooded, it didn’t work… BEEEeeeglub glub glub. This is inspiring me to build a better one now. Awesome build… now I’m thinking about other re-uses for old smoke detectors. What if your house were to flood with DI water? In all seriousness, what happens when this floods the circuitry? Aside from shorting out, you can’t hear underwater piezos very well. Brilliant! I’ve been trying to come up with a solution to a little problem where one of our dogs has suddenly decided to start urinating on a particular spot inside our house. By coincidence this particular dog is also utterly terrified whenever our smoke alarm goes off (which occasionally happens when I’m the one responsible for dinner). It never occurred to me to put the two together. This solution is even battery operated and thus perfectly safe! Just one possible problem before everyone starts dismantling their fire alarms; what type of fire alarm is he using? if it is a light-sensor based alarm, that’s OK, but some fire alarms use a radiation source, in which case it is probably inadvisable to start dismantling them. It really wouldn’t matter what kind. He is creating a system that pushes the test button. Either large smouldering particle or fine smoke/heat detectors will work. In fact anything with a loud beeping system would work. Its is just “pushing a button”. good idea anon to watch out for the detectors that have a radiation device for detecting smoke, but in all seriousness there is most likely more radiation in your basement from radon then what is inside that unit. just food for thought. Hmm. Nice idea but why use the sponge? In the event of a reoccurring issue this sounds undesirable to maintain. Why not try this. For a couple bucks you can purchase a magnetic contact switch.. the type you attach half to a door frame, the other half to the door. Usually the wires attached to this switch go to an alarm that signifies the door is open. Cheap systems exist that set off a screeching door alarm… but using just the magnetic switches, attach one to the alarm with the leads going to the test switch, attach the other to the floor, wall or to some object that won’t move when water comes in. Fit some Styrofoam to the alarm so that it floats in a minimal amount of water. The water comes in, lifts the alarm just a tad or it floats away and beep beep beep. Or simpler yet, for a bit more dollars (10 bucks-ish) get the entire alarm with the magnetic contacts, attach Styrofoam to the alarm side and attach the other as state above. Might be cheaper to buy the 6 dollar ones someone talked about in the comments, but if you had one already laying around, as I do, then some Styrofoam (who doesn’t have this) a couple rubber bands and some screws and tada! There is a commercial product for this called the Leak Frog. They sell it on Woot! all the time for like $5. Typically, a moisture sensor is made by burying the leads in a block of plaster at a fixed distance away from one another. 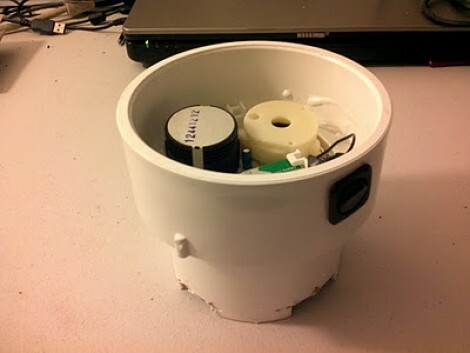 Why am I thinking that just making a float sensor with a piezo alarm would be a lot cheaper? What happens if that bad boy gets submerged? the fact the alarm is designed to warn you about a low battery makes it a good choice, so0 while your may go long, it also allows one to forget about it. someone is going to hear the low battery chirp and fix it. If he were working with the radioactive variety of smoke detector, I bet he could forgo the sponge altogether and instead just use the detector’s native hardware. That small, white chamber is used to detect smoke. It consists of two plates that are put at a difference in potential by a battery, and a small amount of radioactive material that ionizes the air in between the plates. The ionized gas is attracted to one plate and produces a current. When smoke enters the chamber, the current is disrupted. The detector senses the decrease in current and sets off the alarm. I am willing to bet that if water were to enter the chamber, it would be enough to impede the current from the ionized gas and thus trigger the alarm. It would probably be as, if not more, effective at detecting water with the sponge method. I might give this a try tomorrow, although I’m not sure whether the smoke detectors in my house are of the radioactive kind. I would use a mosfet connected to the test probe. The fet will trigger if any amount of water, even tap water contacts the leads. Place the detector on the wall and run the leads down to the floor. It is a very simple circuit and can run off a 9volt battery longer than a smoke detector can.